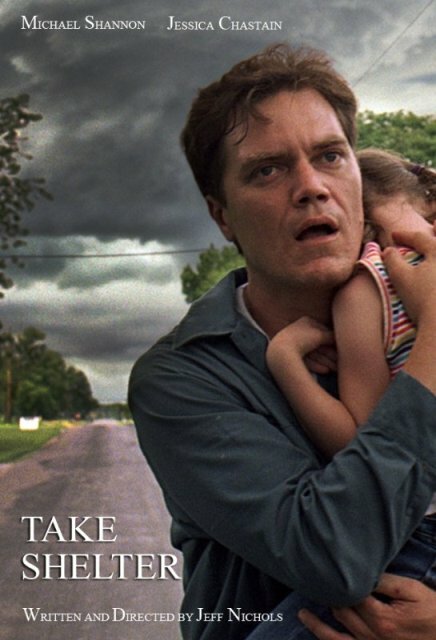 Writer-director Jeff Nichols's psychological drama, TAKE SHELTER, has been winning rave reviews, and with screeners already sent out to the Oscar electorate, I am sure Michael Shannon (BOARDWALK EMPIRE, BUG) will be receiving Oscar buzz for his performance of a man conscious that he is losing his mind. But to be frank, I found this movie near un-watchable - so languorous was its pace, so obvious was its plot trajectory. Shannon plays Curtis, a hard-working man, whose nightmares of violent storms and biting dogs start to seep into his waking life. Convinced that a violent storm is coming he puts himself in financial jeopardy to extend and stock up a storm shelter in his garden, at the same time alienating himself from his sweet wife Samantha (Jessica Chastain). Shannon is always committed and convincing in his performances, but has become typecast as the sympathetic insane person. I also feel that Chastain needs to move beyond roles where she is just an archetypal sweet wife to be adored and put on a pedestal. She needs to break free of this typecasting. I feel that I have yet to see her really act. But the story just moves at such a slow pace, and doesn't really go anywhere. Over-hyped tedium. TAKE SHELTER played Sundance, Cannes where it won the Critics Week Grand Prize, and Jeff Nichols won the SACD award for Best Feature. It also played Hollywood 2011 where Jessica Chastain won Breakthrough Actress, and London 2011. It opened in September in the US and opens on November 11th in the UK. It opens in France on December 7th.